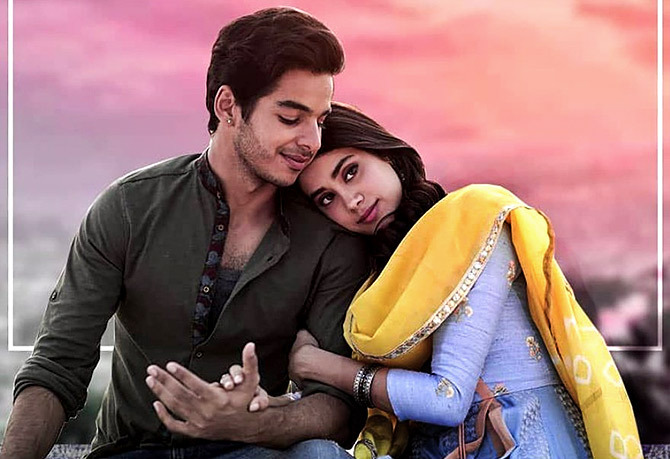 Dhadak is a film that turns Nagraj Manjule's vision into naught, only so that a few more zeroes can be added to Karan Johar's bank account, says Sreehari Nair. This question, casually posed and politely received, also happened to be the spirit of Sairat. While I would argue with anyone who thinks it is a great movie (it's not), Sairat's distinct charm was that though its pay-offs were 'movie-like', its rituals were drawn almost brutally from the life that the director Nagraj Manjule had lived and observed. This was a story not told, but one which seemed to emerge from those sugarcane and banana plantations. In Sairat, love was a pipe-dream while life, land, traditions, and fragile egos were the great equalisers. The love story was conventional, but the people and their issues were bone-level real. It waits for those three friends dancing to the sound of a train at a railway crossing; for that baby-faced killer, Prince, who uses his ancestral sword to cut his birthday cake; and above all, for Archi, who gets her lover at gunpoint, Bollywood-style, only to discover that love is also about peeling garlic cloves. If Sairat was about real life and real people, who paused to ask such questions, then Dhadak is the movie version of Sairat. Shashank Khaitan's remake is tasteless and graceless, but most importantly, it is completely wrong-headed. As a matter of fact, Dhadak is the movie that Sairat was so gallantly trying not to be. It is a film that turns Nagraj Manjule's vision into naught, only so that a few more zeroes can be added to Karan Johar's bank account. The style of the movie makes you uncomfortable, head on. The camera closes in to such extent that the 'context' of the story is lost. The setting is Udaipur, and the only way we know that is true is because Khaitan will pointlessly break into top-shots of the city between scenes. But let's be honest about why this movie was made: Obviously, for the crushing ending of the original. Now, it is the ending of Sairat that told me Nagraj Manjule is a brilliant but ultimately cold 'technician'. The putting-the-squeeze-on-the-audience ending of Sairat was shockingly effective, but it also came with the gloating of Manjule -- he was telling himself and us that he could play the audience like a piano. But if you were left with any doubts about that ending, if it left you wondering, 'Wasn't the ending a wee bit calculated?' you have to watch how Shashank Khaitan mangles it, here in this puerile remake. And you know what? The ending of Dhadak is a howler. With a badly staged sequence involving dolls and evidently fake blood, the ending of Dhadak validates the maxim that 'shock' when pushed to its extreme reverses its nature: It becomes comical. What Sairat managed to convey wordlessly, Dhadak screams out through its final titles that carry some statistics about honour killing: Fake blood, fake body, fake concern! This penchant for exposition isn't merely limited to the closing scene; everything in Sairat that was merely suggested or hinted at, is here italicised, bold, and underlined. Remember how, in the original film, a simple transaction of water being offered to a guest told you so much about the social structures of the village? To give the helpless father his due, how else could he have told his son about the differences in his and the girl's statuses? He could not have said, 'Son, just look around!' because there is clearly not much that separates one mansion in this movie from the other. In this fashion designer's idea of 'middle-class', even a filthy hostel washroom looks one scrub away from sparkling clean. Dhadak is what happens when dandies try to play it dirty! In one sense, the perils that beset the lovers of Sairat seemed so real because what enveloped their love was a sad comedy being acted out by genuine loose cannons and bumbling fools. In that brilliant scene where Prince, the politician's son, slaps his teacher in class, you got the feeling that this was a boy who couldn't help it; that the rage almost flowed out of him. Manjule saw his people not as movie-types, but as people set in their ways; imprisoned by their own behaviour and customs. When Archie rides her motorcycle, her friend who sits behind, clumsily, and making a face, becomes a culture onto herself. The attitudes of the village-folk were carefully dripped into the storyline, and together they powered Paresh and Archie's love story. What scared these people ('Aren't you educated? Why do you want to go fight these higher-class people?' an old man asks Paresh at one point), were things that to our liberal senses may seem outrageous. And yet, there they were! You get none of those social tensions in Dhadak. For 'laughs', we are offered the hero's midget friend, Purushottam, whose idea of 'funny' is cracking the kind of jokes that Gujarati cousins regale each other with during their lonely night-outs. As with most characters in this film, we see the leads, Madhukar and Parthavi, only from the outside. I couldn't really tell Ishaan Khatter the actor from Ishaan Khatter the wide-eyed, hyper-enthusiastic kid. I am not even sure if his actorly energies are yet splicing together neatly or cancelling each other out. The movie doesn't really give you a chance to judge if he can play off other actors well; he seems to be quite the duke of his own domain. Janhvi Kapoor's Parthavi has a small 'theatrical' moment where Khatter's Madhukar expresses his love for her and it appears to cause convulsions in her midrib. For most part, however, the kids don't seem like they belong to the land of the story; it is if they were airdropped to the shooting locations from their flying vanity vans. When Parthavi and Madhukar walk among a crowd, they almost look digitally inserted into the frames. It is because the characters, the drama, and the incidents in Dhadak are all improperly weighted that the centerpiece of the narrative feels inert. In Sairat, when the dream of the young couple is shattered at the end, it hurts because we have seen that dream being built. Parshya cleans the slum and presents it to Archie as a symbol of his love, but she is already missing her old lifestyle. And so, she feels nothing. But they wade through all that, and their imperfections, and their complexes, and their misunderstandings, and their fights, and so what dies in the honour killing is a relationship, built matchstick by matchstick. In Dhadak, we hear Parthavi dissing her royal home and then we see her missing that very home, and we feel caught between the dissing and the missing -- as stuck in an emotional vacuum as those two terribly written characters. All these comparisons may force some to ask: Shouldn't Dhadak be judged on its own terms? And the answer to that question is, 'No you can't do that' because, on its own terms, Dhadak is absolute hogwash. When judging it relative to Sairat, it at least feels like a disappointment -- which is the best that can be said about this film. What Nagraj Manjule achieved with Sairat, in a way, was a freshening of those tropes that populated Hindi films of the 1990s. What Dhadak does to Sairat is thus baffling; it takes Sairat's story -- the most conventional aspect of it -- and squeezes the old tropes back in. Maybe it is Bollywood's arrogance; its way of telling the regional film industries that mediocrity is their province and that they will reclaim it from every act of high-creativity. Sairat taught aspiring film-makers and writers that they could take the squarest of stories and mate them with personal stories, private observations and nuggets from their life, and thus make these stories richer. Dhadak just coolly steps forward and disproves everything that Sairat had proved.